Josh Shogren runs PassionIntoPaychecks.com, where he chronicles his ventures buying, building and selling monetized websites. He’s a young, self-taught online entrepreneur, and promising intern at FE International. Buying, growing and selling online businesses requires you to wear multiple hats at the same time. At 10 a.m. you might be doing keyword research for a new article, and then at 11 a.m. you are negotiating with possible advertisers. You have to possess a wide variety of skills so that you can keep your online businesses running smoothly day in and day out. With that being said, I have found that success usually comes from having mastered a certain skillset and then applying that skill to websites that you purchase. This gives you a competitive advantage when it comes to growing the site, and allows you to spot opportunities in websites before your purchase them. In this article I will be explaining why it is crucial to master a profitable skill if you wish to become a successful website investor. The first step to being successful in any sort of online (or offline) business is to master a skill. It doesn’t even matter what it is, as long as it can provide value in some shape or form. Whether the skill is paid advertising or SEO, just know how to leverage that skill to grow your business. However, some skills will be of more value than others. That is where you will you have to use your own judgement to find those that interest you and can provide value. Being an expert in two or three areas is great, but if you are just starting out I would highly suggest focusing on just one skill. As you continue to learn and grow, other skills will come naturally to you, but it pays to have skills where you’re head and shoulders above the rest. When you master one skill you become an expert, which leads to many benefits. Expertise allows you to identify opportunities to leverage, consistently be able to increase the value of a web purchase and it will help you avoid buying a dud. Below I will further explain each one of them. When you are an expert in a field it allows you to easily identify opportunities that you could take advantage of. For example, let’s say that you have a large amount of experience and success with selling physical products with Shopify, and you spot a business for sale where you could apply these skills. Let’s look at a real example with a website that is currently for sale on Flippa. The site is called gireviews.net, and here is the Flippa listing. Flippa is a great place to buy a starter website because you can find low-cost opportunities to build on, then sell later via an experienced advisor who can give it an accurate valuation and find qualified buyers. The site in this listing reviews Brazilian jiu-jitsu Gi-s, which are the outfits worn in Brazilian jiu-jitsu, and makes an affiliate commission for every sale they make. Even as an affiliate they are making $1,000+ per month, which is not bad at all! However, if you were someone who has mastered the skill of selling physical products with Shopify you would know that you could create and sell your own brand of Brazilian jiu-jitsu Gi-s. This would give you another revenue source as well as allow you to make more money from each sale! Instead of making a 10 percent commission on every sale as an affiliate, you can now earn 30-50 percent profit on each sale when you sell your own brand. This diversifies your revenue sources and allows you to earn more money, both of which increase the overall value of your business. By mastering this skill you were able to identify this opportunity and you knew exactly what you needed to do to make the site earn more money each month. When you master a skill you will get a very solid understanding of what works vs. what doesn’t. To further explain this point I will use the same example of the Brazilian jiu-jitsu Gi review site I used above. Just because you could start selling your own brand of Gi-s it doesn’t mean that you should. By being an expert at selling physical product with Shopify you would be able to decipher whether or not applying your skill would be profitable and if it would make sense. Every website and online business is different and each scenario will require a different approach. When you are aware of the good opportunities vs the bad ones you will be able to choose only the best and pass on the rest. Someone who isn’t an expert with Shopify stores would have a much harder time deciding whether or not buying this Gi review website to start selling your own brand is a profitable idea. However, when you are able to find that good opportunity that allows you to leverage your skill you will have a very high chance of being a successful. When you master a skill you increase the chances of being able to profitably buy, grow and sell websites. For example, let’s talk about the website that I mentioned earlier in the article, and bought a few weeks ago for $1,250. I am very confident that I will be able to increase the earnings and traffic because I noticed areas that I could improve on using my own skills. With my SEO and AdSense optimization skills, I am able to spot opportunities that will grow this site right away such as creating more ads, testing the different ad networks, and targeting local long-tail keywords. Since I was aware of these growth opportunities before I purchased the website it gave me confidence in knowing that I would have a very good chance of having success with this website investment. This idea of using your skills to spot opportunities for growth is important because it allows you to know which websites you will be able to have a large impact on. This way you will only buy websites that you know you can improve, which in turn leads to you having more consistent success with website investing. Much the same as you would be able to identify good opportunities you would also be able to spot the duds. This will keep you from wasting time and money on a website that has no potential. This is probably more important than being able to spot a good opportunity because a lot of money/time can be wasted trying to revive a business with no hope. Let’s continue to use the same GI review site that we have been using to explain this scenario. When you reach out to one of your manufacturers to ask about this product and they say that production would cost a lot more than you originally planned. Now, instead of making 30-50 percent profit on each sale, you are now only making 15 percent. It is also going to take up to 6 months before your manufacturer can complete the first shipment. These are just example problems, but it proves the point that you may not be aware of all of the problems that could come with a business unless you have that expertise in that area. By mastering a skill you will be able to keep yourself away from toxic situations while the person with only a small amount of experience might be blind to such issues. I now want to use my own personal skills as an example and show you how I have been able to leverage them. I would consider my two biggest strengths to be SEO and keyword research. I have been homing both of these skills for the past eight years, and I have had plenty of success from utilizing them. More recently, I have been able to develop my skill of optimizing websites that are monetized via AdSense thanks to working first-hand with multiple websites that were monetized via AdSense. I want to give you a real-life example of how I was able to apply these skills that I have mastered to help spot a website investing opportunity. A couple weeks ago ago I purchased a new website, You can see the website’s Flippa listing here. Yes, I know it was only making $135/month and that probably doesn’t seem like it would be worth the time. However, I am very confident that I can get the site making $500/month within 6 months, which would increase the value of the site to $10,000 to $15,000. Why am I so confident that I can take this site from $135/month to $500/month in 6 months? From my experience and skills that I have mastered I know this site is currently extremely under optimized and missing out on a ton of targeted traffic. To give you all as much value as possible I am actually going to show you exactly why I think it is under optimized. Skill Used: I was able to spot this opportunity due to my skills with optimizing AdSense layouts and knowing if a site is currently under optimized. Without this skillset I may not have been able to spot this opportunity. I know that Google allows each page to have a total of six ads per page, three link units and three regular ads. From that alone I know that this site is leaving a lot of money on the table. I also know that job training and educational niches such as this one have a very high CPC because it’s a lucrative market for the advertisers. Just by adding a few more ads per page I am very confident that I can at least double the earnings from the site practically overnight. And yes, I understand it doesn’t take a genius to know that this site was being under monetized. However, I knew that Google allows six ads per site, was familiar with the most common AdSense layouts, and also knew that this market has a high CPC, which allowed me to quickly assess this site and determine that it was a good pickup. Not to mention that knowledge allowed me to act quickly on this site and make a decision on whether or not to purchase it. This site was sold within a few hours of being listed on Flippa because it had less than a 10x monthly multiple. If I wasn’t able to make quick, yet knowledge decisions, I would not have been able to quickly seize the opportunity. I was able to spot a huge opportunity in this site from using my SEO and keyword research skills. First, the site is not optimized at all in terms of title tags, URL structure and meta descriptions. However, that is not the area where I see the most potential. The opportunity that most excites is me is the fact that I can target keywords based on states and cities. 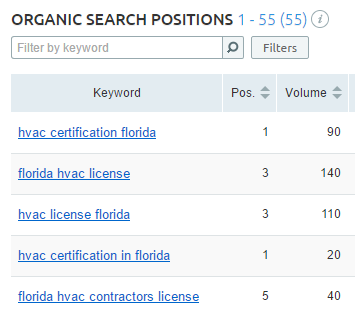 For example, keywords such as “Florida HVAC license” and “Texas HVAC training” are ripe for opportunity. Right now, the website is only targeting two different states, Florida and Texas – that’s it! There are 48 other states to target as well as countless large cities that get a decent amount of search volume. The best part about these keywords is that they are very easy to rank for since they are local search terms. 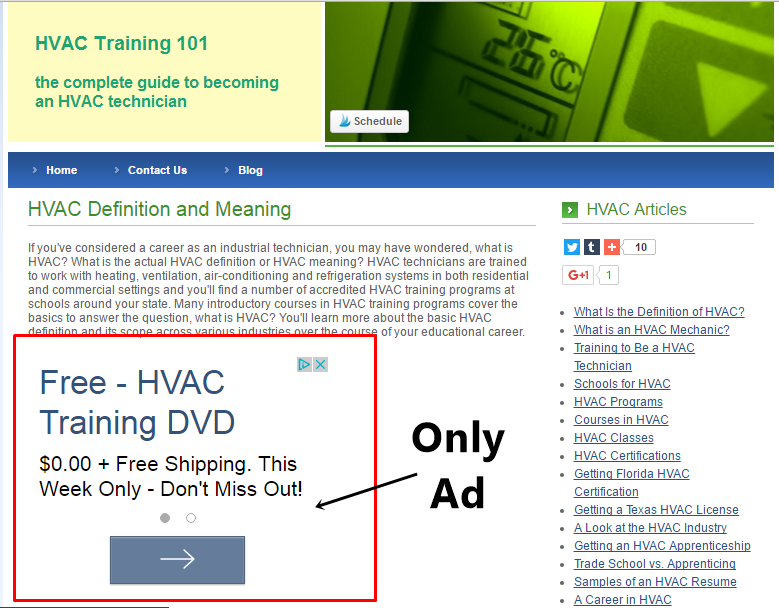 I am not going after broad search terms such as “HVAC training” or “HVAC classes,” but instead very targeted local keywords which makes it easier to rank in Google. This site has already had success ranking for Florida- and Texas-based keywords and I think expanding long-tail terms to include other states will provide a ton of traffic. This proves that it is fairly easy to rank for these types of local keywords. Now, I can start expanding to other states, which provides a huge amount of potential. As you can see from this example, with my SEO, keyword research and optimizing AdSense knowledge I was able to spot this website. I am very confident in my ability to increase the value of the site by applying these skills. This same exact thing can be done with a ton of different skills as long as you have mastered them and understand how to use them. The idea of mastering one skill or a system is not new when it comes to investing. Matter of fact, it is actually one of the more basic investing concepts and it aligns perfectly with website investing as well. There are countless types of real estate investments such as rentals, flipping, apartments, raw land, and duplexes. 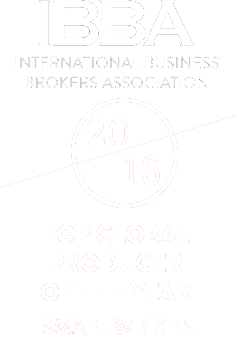 However, each one of these takes a different skillset to achieve success. You will often find that people have the most success in real estate by staying within one type of investment. Someone who has had success, buying old run-down houses, fixing them up and then renting them out will almost always stay within that type of investment. Because they have built up enough experience and knowledge within that one type of investment that they have mastered it. This allows them to continue to have success in the same area over and over again because they know what works and what doesn’t. All of these things apply to website investing as well. By sticking to what you know you are able to increase your chances of having success. Similar to real estate, there are hundreds of strategies and techniques to trading stocks. For example, Warren Buffet has had a huge amount of success with value investing. This means he buys stock of companies that he feels like the market currently undervalues. This is Warren Buffet’s “system,” or skill, that allows him to consistently choose good stocks and make a solid ROI. Buffet mastered that type of investing and used it to make a ton of money. This same principle of mastering one system or skill translates over to buying and selling online businesses as well. Whether we are talking about real estate, stocks or websites you can see how this same idea of mastering a skill is incredibly important for continued to success. 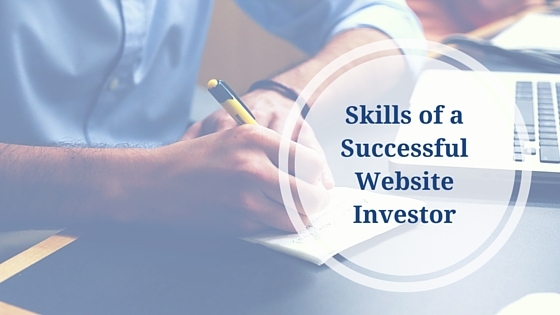 Mastering a skill is very important, but there are a few skills that every website investor should have that act as the foundation. Without having a solid foundation to build upon you will not understand how to apply the skills that you mastered in a meaningful way. Let’s take a look at these skills now and I will explain why they are important. This means having a good understanding of what is going on in the website buying/selling market. If you don’t keep a pulse on the market you will become out of tune with it and it will end up costing you. Common Multiples: Understanding the common multiples that are used to value websites is very important. It will allow you to determine if a website is under or overvalued. A few years ago the common multiple was 2x annual profits, and now it closer to 2.5x yearly revenue. Also, you should know the kind of multiples different types of business models get. For example, SaaS businesses often get higher multiples than affiliate sites. Differences Between Marketplaces: There are many options when it comes to finding a place to buy and sell online businesses. Knowing the differences between marketplaces is very important. For example, Flippa is the largest marketplace, but it is also where the most scams take place due a lack of vetting process to list a website for sale. Flippa is also where the websites on the lower end of the scale get sold. On the other hand, FE International sells higher end sites and each one goes through a vetting process, which ensures each business being sold is legitimate. Knowing the differences between the marketplaces is very important, both when buying websites and selling them. Know the Trends: Being able to spot trends is very important because it allows you to capitalize on them as well as stay out in front of them. One important trend to keep your eye on is the new business models that are starting to become popular within the marketplace. An example of this would be the Amazon FBA businesses that have become hugely popular in the last year, and now a lot of people are looking to sell them off. Other trends to keep your eye on are new marketplaces to sell websites, and the rising multiples websites are now getting. The best way to gain this market knowledge is to be in it every single day. What I mean by “being in it” is that you should be scouting listings every day. This means looking through each of the websites listed and understanding how the site was valued, where the traffic is coming from, how it is earning money, and overall just understanding how the marketplace works. I would suggest spending at least an hour everyday looking at and analyzing websites that are for sale. Honing your ability to analyze a website’s information to determine a good vs. bad investment is crucial. If you don’t analyze every single aspect of a website before you purchase, it you could miss important information that could make or break that investment. Due diligence is very closely related to being analytical, and they go hand in hand. I would consider the skill of being analytical to be vital in making sure that you purchase only high-quality businesses. You may be able to run the day-to-day tasks of one online business, but as your portfolio of websites grow, your hours will become limited. This is when the skill of being able to delegate becomes so important. One of the best ways to delegate your tasks is to outsource them. Learning how to outsource parts of your business to free up your time for the most important jobs is vital to keeping your businesses growing. This means you have to know what tasks can be outsourced, how to hire people, how to train them and how to manage multiple employees. It is not easy being a website investor because you have to be knowledgeable in many different areas. However, as I explained within this article mastering a skill is the key to being able to have success buying, growing and selling online businesses. I hope that you enjoyed reading and before I end this article I want to say one thing – go learn and master a skill ASAP, it WILL pay off.